Twoandahalfweeks in India – an old tribal ladies’ joke – Go India, go future! During a visit of a tribal village close to the silent valley national park in Tamil Nadu we’re welcome in a very friendly and traditional way. Most of the village people are gathered in the Community room and expect us. When we arrive, the chairs are prepared for sitting together and tea is offered. We put off shoes, enter and like also in many other locations there is a huge spirit of friendliness around. During a short presentation given by the village leader the tribal women sit on one site, we as guests in the middle, and on the other site the tribal men. 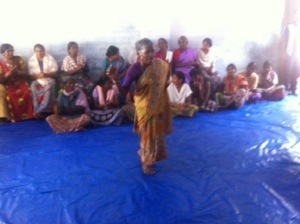 An old tribal woman who sits close to me watches, smiles and starts to talk with hands and feet. She must be around 75 years, a very smart, small person, dressed in a sari and with nice jewelleries on her body. She moves still like a young person … there is the energy of a fifteen years old girl in her. When the tribal leader talks about coffee, vegetables and pepper cultivation, a plate with pepper and coffer beans is shown, passing from person to person. Then it is my turn: the plate with pepper is in front of me. The old lady makes me understand that I should try one piece of pepper. Her eyes are shining. I smile, take one and … eat it. The old women starts laughing loudly. Her women friends join in – and I must laugh, too. These tribal people are nice people who enjoy life and give a lot of their positive thinking also back to us 🙂 … Be it also via a joke. After this visit I think they have a happy life, probably much better than many people in Germany and other developed countries, especially thinking of many old people who are feeling alone and sitting hours just there watching TV.